The Global Volcanism Program has no activity reports for Atlin Volcanic Field. The Global Volcanism Program has no Weekly Reports available for Atlin Volcanic Field. The Global Volcanism Program has no Bulletin Reports available for Atlin Volcanic Field. A group of late-Pleistocene to Holocene cinder cones lies on the Teslin Plateau in NW-most British Columbia, E of Atlin Lake. The largest volcanic feature is Ruby Mountain (named for the brilliantly colored tephra deposits on the summit and flanks), which has been partially dissected by Pleistocene and post-Wisconsin glaciation. Two basaltic cinder cones at the heads of Cracker and Volcanic Creeks lie within glacially dissected U-shaped valleys and were considered to be of postglacial age (Edwards et al., 1996). Placer miners working in the region at the end of the 19th century reported an eruption from the Ruby Mountain area about 80 km S of Gladys Lake (Hickson et al., 1994; Edwards et al., 1996) during which ashfall was reported for several days and the miners were able to work at night due to incandescent glow. No field evidence has been found, however, for a volcanic cone or lava flow in the Atlin area young enough to have been the product of an historical eruption, and the report is considered uncertain. Aitken J D, 1959. Atlin map-area, British Columbia. Geol Surv Can Mem, 307: 1-89. Edwards B R, Hamilton T S, Nicholls J, Stout M Z, Russell J K, Simpson K, 1996. Late Tertiary to Quaternary volcanism in the Atlin area, northwestern British Columbia. Geol Surv Can, Current Res 1996-A: 29-36. Edwards B R, Russell J K, Anderson R G, Harder M, 2003. Overview of Neogene to Recent volcanism in the Atlin volcanic district, Northern Cordilleran province, northwestern British Columbia. Geol Surv Canada, Current Res, 2003-A8: 1-6. Harder M, Russell J K, 2007. Basanite glaciovolcanism at Llangorse Mountain, northern British Columbia, Canada. Bull Volcanol, 69: 329-340. There is no Deformation History data available for Atlin Volcanic Field. There is no Emissions History data available for Atlin Volcanic Field. Cracker Creek cone (center), the small vegetated hill seen here from the west, is the youngest feature of the Atlin volcanic field on the Teslin Plateau in NW British Columbia. 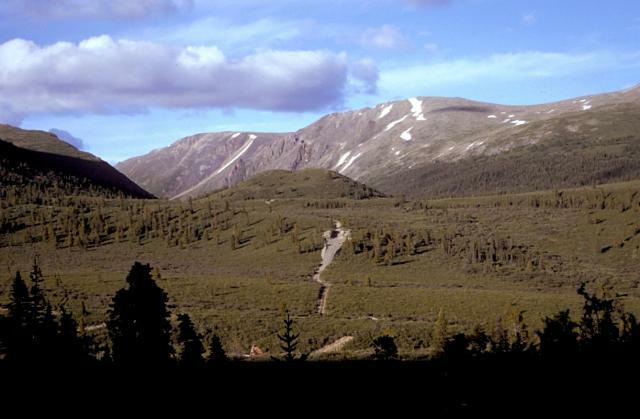 The small cinder cone lies at the head of Cracker Creek, immediately east of Ruby Mountain volcano, and may have been the source of a large lava flow that partly filled Ruby Creek. The lower west side of the cone appears to be partly covered by glacial till, suggesting that the cone is older than the most recent glacial advances down Ruby Creek. Photo by Ben Edwards, 2000 (Dickinson College, Pennsylvania). There are no samples for Atlin Volcanic Field in the Smithsonian's NMNH Department of Mineral Sciences Rock and Ore collection. Large Eruptions of Atlin Volcanic Field Information about large Quaternary eruptions (VEI >= 4) is cataloged in the Large Magnitude Explosive Volcanic Eruptions (LaMEVE) database of the Volcano Global Risk Identification and Analysis Project (VOGRIPA).